If the pages you’re creating won’t be viewed on mobile devices (such as an iPad or a smartphone), you can create web pages with beautiful Flash video. 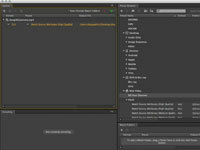 Adobe Flash Professional CS6 has its own built-in video encoder. Full motion video in Flash is a beautiful thing. You tailor the video for the target audience viewing the website. If your target audience accesses the Internet with a slow connection, you create a video with smaller dimensions and higher compression to load and stream without stopping. You can also add a controller to the video, which enables visitors to control playback of the video. 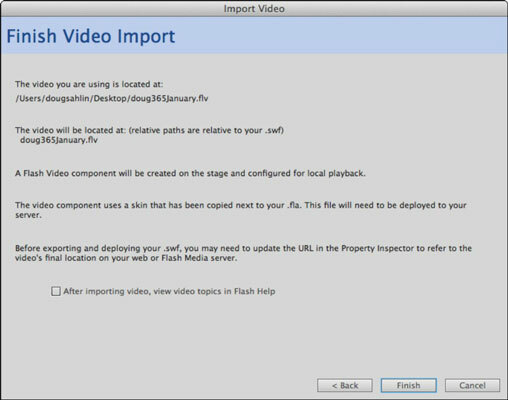 When you need to quickly add a video to a Flash movie, you can do so by encoding the video within Flash. 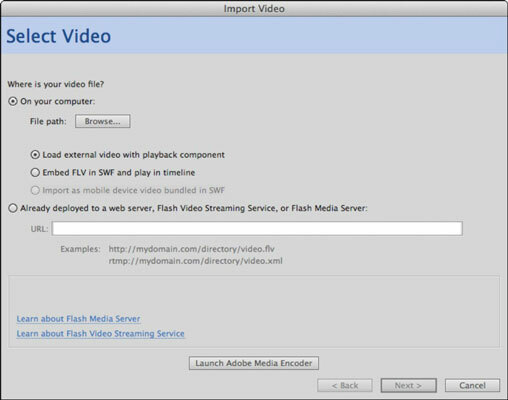 When you encode a video in Flash, you can launch the Adobe Media Encoder, which enables you to encode the file. You then come back to Flash to add the encoded video to your project. 1Create a new document the same size as the video you’re incorporating on your web page. Make sure you match the frame rate of the main movie. The Import Video dialog box appears. 4Select the video you want to import and then click Open. The path to the video and filename appears in the File Path field. If Adobe Flash Player doesn’t support the video format, a message to this effect appears telling you it’s necessary to use Adobe Media Encoder to convert the file to a supported format. 5Accept the default Load External Video with Playback Component option unless you have a client who is rich enough to afford Flash Video Streaming Service or Flash Media Server. Alternatively, you can embed the resulting Flash video FLV file into the SWF file. 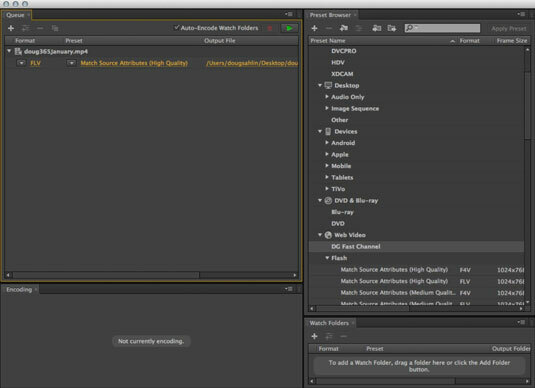 6Click Launch Adobe Media Encoder. Flash prompts you to save the document. After you save the FLA document, the Adobe Media Encoder dialog box appears. 7Accept the default setting or choose a different setting from the Settings drop-down menu. After you click Settings, you are faced with a plethora of choices. In most instances, the default preset is right on the mark. However, if you’re familiar with video encoding, feel free to choose the setting you deem best for your intended audience. 8Click the Start Queue button (looks like a video recorder Play button). Adobe Media Encoder does its thing. If you have a long video, this would be a good time to grab your favorite snack or beverage. If you did decide to take a break while the video is encoding, you’ll know when it’s done, unless you’re in the next county or do your work in a soundproof room. The Adobe Media Encoder plays a rather distinct sound when encoding has finished. After the video is encoded, you can close Adobe Media Encoder. Navigate to the video file you just encoded and open it. 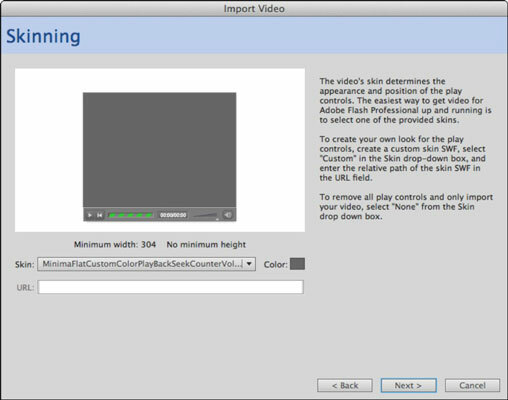 The Skinning page of the Import Video Wizard appears. 11Select a skin from the Skin drop-down menu. After you select a skin (interface for the video), a preview appears in the preview pane. Unless you’re going to use the video as part of a Flash website, choose None. All you need is the encoded Flash video. You can add a skin when you add the video to your web page in Dreamweaver. 12Accept the default skin color. Alternatively, click the Swatch and choose a different color from the Swatches panel. 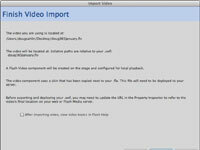 The Finish Video Import page of the Import Video Wizard appears. 14Review the information and click Finish if you’re satisfied. If not, click Back and navigate to the page on which you need to make changes. 15Choose Control→Test Movie to preview your video. When you encode video via Adobe Media Encoder from within Flash, the video encoder creates an FLV (Flash Video) file with the same name as the source file with the .flv extension. You need to upload this file to your web server along with your web page.